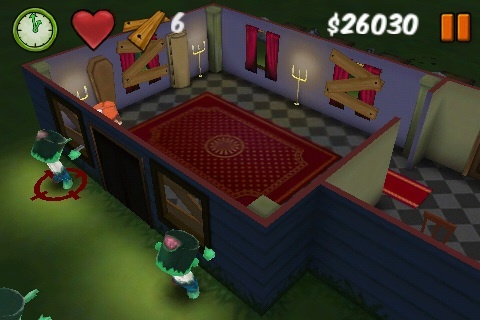 Zombie Wonderland is from Chillingo Ltd and is a survival style, single player, iPhone, iPod, iPad compatible game. You play as Chuck (a guy who looks like a trucker and talks like a grizzled Patrick Warburton) as he defends his home from Zombies who try to break through his windows. Zombies have a pretty large following. They have legions of books, hordes of comic books, and they take a big bite out of the videogame industry. Does Zombie Wonderland stand out from the rest? Well, it definitely has its merits, but not without some stumbles. The game plays similar to a Tower Defense game, but with only one defender: you. You tap windows on the side of your small one room house and you shoot at zombies with your infinite shotgun. The game runs smoothly and Chuck, the main character moves with lightning speed. There is a tutorial that teaches you the basics but as you gain new abilities or face new enemies, the game presents you with popups to help out. The sounds are alright, with the big highlights being the main character, Chuck, when he screams “FLAMIES!” The rest of the game really only features Zombie moans, shotgun booms, and the cutscenes which consists of word bubbles and still frame images. It’s a decent presentation and does it’s job well. The 3D in this game is great. The house you start out in is only level 1. You move into different locations with different layouts, rooms, and windows to manage. Each level has a distinct look and feel. The Zombies remind me of Lego characters and their big floating arms take me back to the old Rayman days. There are different Zombies as well. Burning ones that deals more damage, old Grannies that can destroy anything with their scream, big ugly ones… and that’s about it for now at version 1.0. They are still updating and creating more content however, so keep an eye out on that. Game play is fast and sometimes can feel overwhelming, but it’s in that way that the game captures the true essence of the Zombie genre: Fighting off an army all alone in a small claustrophobic house. 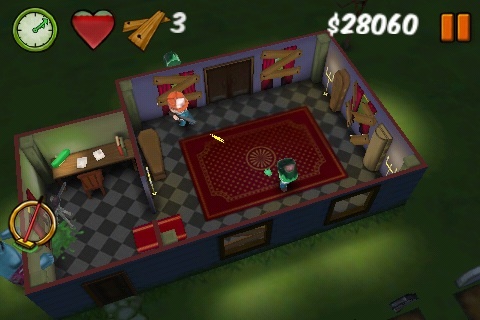 Progression usually involves gaining new defense ability such as boarding up the windows or placing a turret to auto-fire on the zombies. I felt that the pacing was a bit too slow however. A single level lasts a long time and by the time you reach the level 3 or 4, you are basically fighting the same enemies with the same weapons for long stretches before you can finally unlock a new item. Zombie Wonderland definitely has a repetitive nature to it. Tap the screen to board up a window. Rub the screen to clean the floor of Zombie guts. Tap the screen to shoot the huge group of zombies outside. With each new upgrade, you get to tap the screen some more in what eventually starts to feel like busy work. This is especially noticeable when boarding up windows during a Zombie wave. This however, is alleviated over time by further upgrades which increase the fun of this game. And trust me, the game gets better as you go further into the levels. AppSafari review of Zombie Wonderland was written by Joseph Ho on July 30th, 2010 and categorized under Action, App Store, Games, Tower Defense, Universal. Page viewed 4911 times, 1 so far today. Need help on using these apps? Please read the Help Page.